Well, it’s like the old sayings go… what goes around comes around, and karma is one nasty b*tch. And right now, nobody knows that better than a groom in South Africa who recently felt the swift and mighty stab from karma’s mighty sword. The aforementioned groom got quite a nasty surprise on his wedding day, when a woman he had been seeing, who was not his bride to be – his mistress – decided that she deserved to be present at her lover’s wedding just as much as all the invited guests were. Even more so, she decided that there were two people who deserved to be wearing wedding dresses that day; the bride, and well, herself. Yep, that’s right. The groom’s mistress showed up at his wedding wearing a wedding gown. I know, I know… this story is amazing. Who knows though, maybe it’s merely a coincidence. Maybe the poor thing heard her lover mention some wedding over and over again and got confused, maybe she thought he was talking about their wedding? Or y’know maybe she completely meticulously planned her revenge for months in order to ruin the cheating scumbags life once and for all? …I’m going to go with the second option on this one. The clip was eventually uploaded to Twitter and, unsurprisingly, quickly went viral. As if the soundtrack of screaming (laughing!?) guests wasn’t enough, we also get front-row seats to one of the most chaotic and perplexing scenes I’ve ever witnessed. We can see a man dressed in a suit (Best Man maybe?) trying to usher a hysterical woman wearing a wedding dress (assumption; the mistress) away from what looks like the groom and actual bride who are just stood there trying not to make eye contact with the previously mentioned hysterical woman?? I’m honestly not sure what shocks me more… the whole situation itself or the fact the bride is just stood there awkwardly next to her cheating soon-to-be husband like nothings going on? Although, maybe ‘awkward’ is putting it a little too lightly – this is honestly one of the most disastrous wedding days I have ever witnessed during all my time on the internet. But you know what, if you insist on having a mistress, then it’s exactly what you freakin’ deserve. 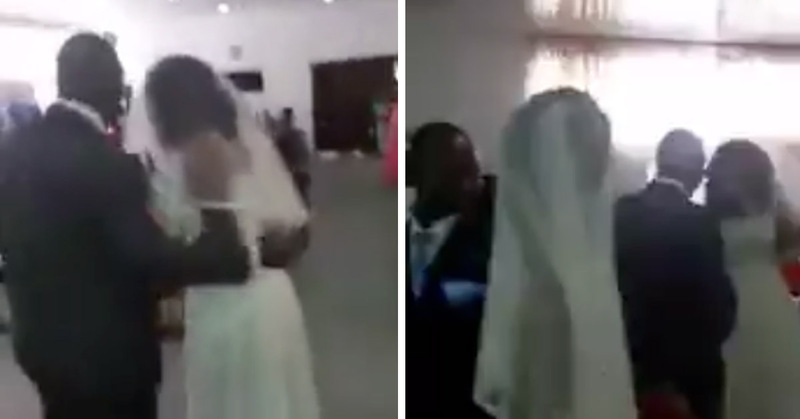 Side chick rocked up at the wedding also wearing a wedding dress … groom trying to calm the situation. DYING to see this video? of course, you are. I mean, at one point it does look as though a bridesmaid tries to step in in order to help calm down the “mysterious” woman in the wedding dress (aka not the bride), however I’m not sure anyone is really having any luck, which makes me question whether anyone really did want to diffuse the situation. Well, come on, it is pretty darn entertaining. There were obviously a lot of people out there with the same thought process as myself, which is easily seen from the comments left on the video (which has now been seen around 680k times at the time of writing. If only there was some way this poor guy could have prevented such an atrocious thing happening on one of the most magical days of his like, say, for example, oh I don’t know, not cheat on his fiance with a side chick?? Some men just never learn.